* You can buy pre-cut butternut squash at some stores but I don't mind using the full one - I buy smaller ones that are a bit easier to hold, peel the outside, cut in half, scoop out the seeds and then cut into 1.5inch cubes. If you have time to roast the squash and onions beforehand do so, but if not skip to step #3. 2. 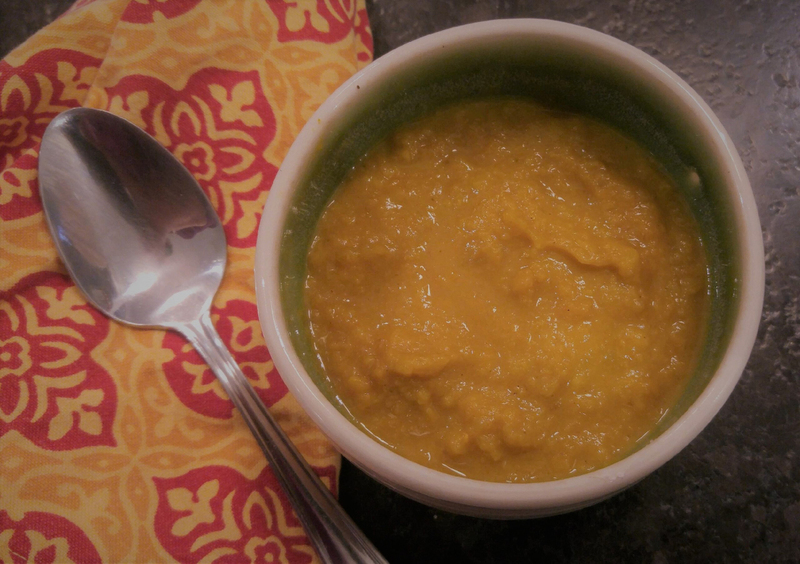 Toss the butternut squash cubes and onion pieces with 1 tablespoon of olive olive. Spread them out evenly on a baking sheet. Roast the vegetables for 20-30 minutes at 425 degrees or until fork tender. 3. About 5 minutes before butternut squash and onion are done, heat the other tablespoon of olive oil over medium heat in a stock pot. Add the diced carrot and let it cook, stirring occasionally, until it starts to soften, about 5 minutes or so. 4. Add the garlic, roasted butternut squash, roasted onion, diced tomatoes (plus the juice from the can), and vegetable stock. Give it all a good stir and then add the cannellini beans, sage, and thyme leaves. 5. Bring the soup to a simmer and let it all cook together for 15-20 minutes. 6. 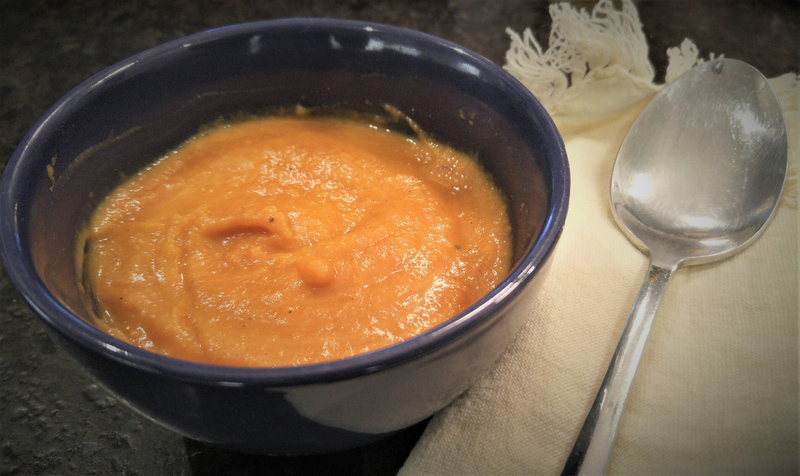 Once the soup has simmered, remove it from the heat and puree it using either an immersion blender or stand blender (be sure to let the soup cool before using a stand blender and then reheat for serving). 7. Stir in the apple cider vinegar – and then add the heavy cream. Makes approximately 6 one cup servings. 1. Heat the olive oil in a large soup pot over medium heat. 2. Add onions and garlic and sauté for 3 minutes. 3. Add the carrots, celery, and basil and cook for a few more minutes until the spices coat them nicely. 4. Add the rest of the ingredients and bring to a boil. 5. Reduce heat and simmer for 30 mins-60mins covered - until broccoli & lentils are cooked. 6. Using a wand blender, puree until smooth. Garnish with green onions and parmesan or nutritional yeast if desired. Makes 6 cups. Freeze some portions for workdays on the run. Excellent toddler and kid food too! 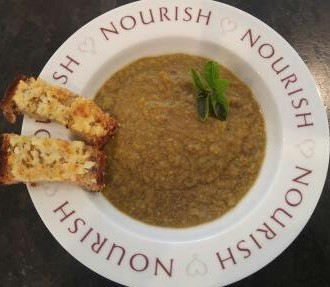 A well balanced (carb and protein) vegetarian soup. 1. Heat oil in medium pot over medium heat. 2. Add onion and sauté for 5 minutes or until soft but not browned. 3. Add ginger and garlic, cumin, turmeric, coriander seeds and cayenne and sauté 1 minute longer. 4. Add lentils and cauliflower and stir with spices. Season lightly with salt. 5. Add stock to cover and bring to boil. 6. Reduce heat and simmer for 15- 20 minutes or until lentils are soft and cauliflower is tender. 7. Puree soup with a hand blender. If soup is too thick, thin down with extra stock. 8. Return to pot and stir in yogurt or coconut milk. Season with salt and pepper as needed.